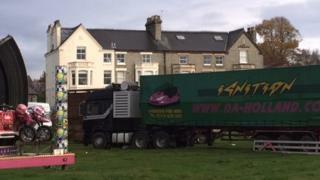 A charity has been fined after a cyclist lost her leg when she became trapped under a lorry carrying dodgems. The woman, in her 50s, was hit by the lorry on Midsummer Common, Cambridge, in November 2015 on the site of an annual bonfire night fireworks. Organisers Cambridge Live "failed to make suitable and sufficient assessment of the risk" to the public from fairground vehicles, a court was told. The charity admitted health and safety breaches and was fined £30,000. "We very much regret those failures and the injury that was occasioned as a result," a spokesman for Cambridge Live said. Peterborough Magistrates' Court was told the woman spent many months in hospital undergoing operations and suffered psychologically from what happened. The bonfire event went ahead as planned but organisers cancelled the associated funfair, stating it would have been inappropriate for it to go ahead. Matt Gowen, for the defence, said there had been "a wholesale change" since the event at the not-for-profit charity, which was set up by Cambridge City Council to run events in the city. The Health and Safety Executive (HSE) issued an improvement notice to Cambridge Live and there is now a process for closing footpaths across the common during the set-up and take-down of events. The magistrate noted a substantial fine would have an impact on the Cambridge community, but said there was a number of people at risk using the common at that time. As well as the fine, Cambridge Live has been ordered to pay legal costs of £6,654.37. The spokesman for Cambridge Live said the firm had accepted failures "at a very early stage" of the HSE investigation and accepted the fine. "Following the incident we have invested heavily in reviewing our procedures and consequently have added additional safeguards to avoid any incident of this type occurring in the future," the spokesman added.